Start any maintenance for computers by shutting down your computer. Is your keyboard a wired desktop sort? If so, unplug the keyboard too. We are talking cookie crumbs, bits of bologna sandwich, cat hair and other debris. Tilt the keyboard upside down and shake it gently. If you have a can of compressed air, spray a little air around the keys - or try using a vacuum wand very gently around all the vents and keys. Dip a cotton swab into the alcohol and swab around each key. Change cotton swabs as needed. Dip a cloth or towelette into the isopropyl alcohol, wring if needed so the cloth is just damp, and brush it along the tops of all the keys and surfaces. Your Enter key and Spacebar may be particularly dirty so give them a bit more attention. Use your toothpick or toothbrush gently to take out really serious grime and leftover tape or sticky note residue. 3. Dry carefully with your dry, lint-free cloth to remove dust and polish the keyboard. And now is the time to plug everything back in - a simple computer clean up is done! Got a Big Computer Mess on Your Hands? 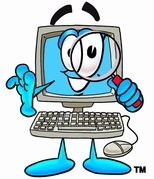 If your computer has suffered a liquid spill or is showing signs of deep down dirt - like overheating or sticking keys, a more thorough cleanup computer regime may be in order. Removing keys and cleaning the trenches underneath is a job best left to the pros. Not all computers are designed to have their keys removed - and some have limited access even if you do succeed in getting all 100 or so key tabs off without breaking or losing any. It may be safer for your machine and your sanity if we clean your computer thoroughly from the inside out. Call for a quote on a deep clean computer clean up. 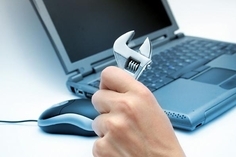 Make maintenance for computers part of your routine. A clean computer just works better! Run "Defrag" to defragment your files. Run "Disk Cleanup" to delete unneeded files. Clean out files from your temporary files directory. Back up your files and store them away from your computer.